Huge Selection of America’s Best Elite Whirlpool Bathtubs with 20% more water depth in the tub for extra whirlpool jets and bathing comfort. 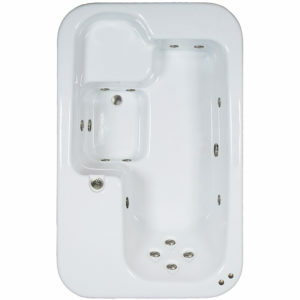 Large two person whirlpool tub with outside dimensions of 60 inches by 48 inches (6048). 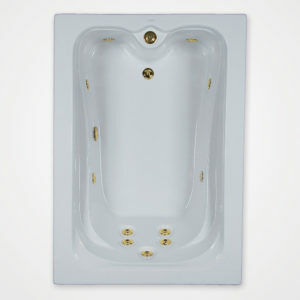 Persons bathing in the 6048 Elite therapy bath face each other and have plenty of room to stretch their legs. This beautiful design has a center drain with a top overflow design. Purchasing a bath with a top overflow allows the tub to be filled 20% more than a standard side overflow design. WaterTech is the only manufacturer that incorporates a top overflow into their tubs. Great 2 person whirlpool bath! The dimensions are 64 inches long by 64 inches wide allowing for a large internal bathing well. Each bather has a different back jet massage pattern. The top overflow design, on the top deck of the tub, is an exclusive feature of WaterTech Bath Products. 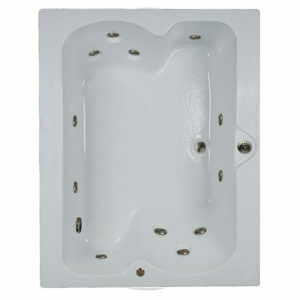 An outstanding design 66” in length allowing maximum leg room, when the space for a bath is restricted. 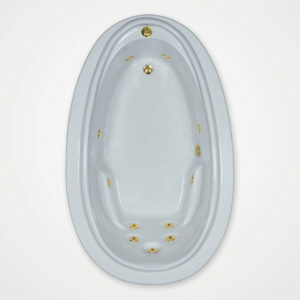 Two gentle curved indentions at the foot of the tub gives this jetted bathtub more leg room than any comparable bath. WaterTech’s exclusive top overflow/drain design makes this tub the deepest whirlpool bath of its size. A unique jetted bathtub design with maximum leg room. Two gentle curved indentions at the foot of the tub gives this jacuzzi style bathtub more leg room than any comparable bath. Watertech’s exclusive top overflow/drain design makes this tub the deepest whirlpool bath of its size. 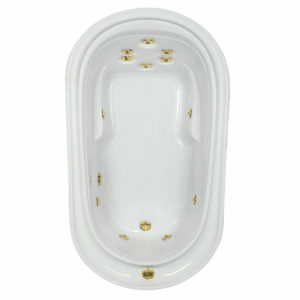 Most baths have a side wall overflow that does not allow the tub to be filled to the top. 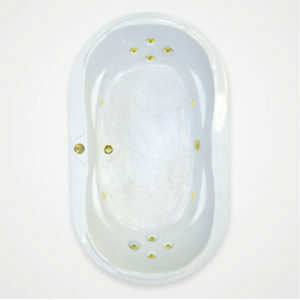 This single person bathtub provides a powerful full body massage from the soles of your feet to your back and neck area. 5 jets for the back and neck and 6 jets massage the torso, legs, knees, feet, hips etc. The outside dimensions are 72” in length and 44” in width giving the bather an extremely large bathing area that will accommodate individuals of all sizes. 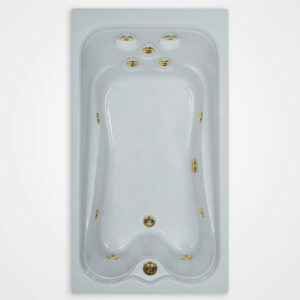 A two person jetted bathtub that has a total of 12 jets to massage bathers. 6 back and neck jets, 2 foot jets and 4 jets provide massage therapy for the torso, hips, legs, knees, ankles etc. 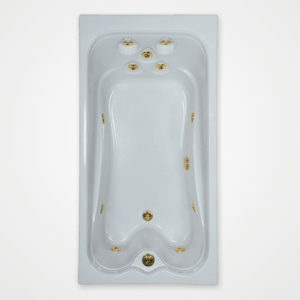 The bathtubs wide bathing area allows bathers to sit side by side and extended leg room is provided each bather as a result of the foot end of the tub being curved. Watertech’s exclusive top overflow design, only available from Watertech, allows the bathtub to be filled within 2 inches of the top of the bathing area insuring the bather gets a full body massage from the soles of their feet to the their neck and shoulders. A uniquely engineered top deck allows water to cascade over the bathtub’s bathing well into a perimeter overflow channel, if the bath is overfilled. Watertech’s exclusive top overflow design, only available from Watertech, allows this single person bathtub to be filled within 2 inches of the top of the bathing area. Baths with standard side overflow have a shallow water depth with the maximum water level 4”- 6” below the top of the bathing area. 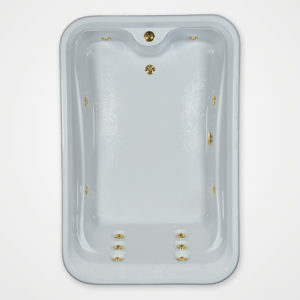 The Extra deep water depth of the 7343 Elite Whirlpool Bath is a feature offered in all of the WaterTech's exclusive Top Overflow designs and is available as a whirlpool bath, air bath or combination of both whirlpool and air massage systems. 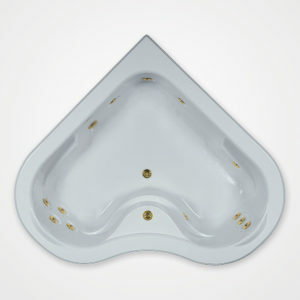 Two sculptured acrylic headrests slowly rise from the tubs top deck to provide a comfortable resting place for the head and neck while bathing. Sloping arm rests are provided to allow for bathers to relax, lay back, stretch out and enjoy the benefits of a hot water body massage. At each end of the tub are 4 adjustable back jets which massage the bathers back and 4 powerful adjustable jets are strategically placed to massage the hips, legs, and feet. A free pulsating jet is provided and can easily interchange with any jet. The tubs spacious bathing well can fit 2 people comfortably and the tubs extra length can accommodate individuals with longer legs. All waterlines are rigid 40PVC pipe, U.L. listed for 100% drainage, assuring that the pipes and pump stay clean and sanitary at all times! There are numerous options available including an electric heater, metal jet finishes, faucets etc. Most options ordered are factory installed.